Creative AI (and real-world GLaDOS wannabe), Angelina, has designed a game about humans fleeing sentient robots who want to kill them. Nope. Not creepy or weird at all. Writers such as Ray Kurzweil defined the so called "Singularity" as the moment in time when an artificial intelligence becomes powerful enough to design another intelligence that surpasses, and ultimately renders powerless, human intelligence. The new game Space Station Invaders, designed from scratch by a freaking computer, may not be enough to push mankind over the Singularity hump once and for all, but I do know one thing: We're a hell of a lot closer now that an artificially intelligent robot has personally developed a game in which other artificially intelligent robots try to hunt and kill human beings. Now, before you try to arm yourselves with makeshift mobile EMPs and struggle to remember the correct pronunciation of "Klaatu barada nikto," perhaps a more detailed explanation is in order. A few years ago, mad scientist Michael Cook began work on what (who?) is now known as "Angelina," an artificial intelligence capable of working with a set of predetermined graphical and auditory assets, and assembling them into a fully functional game designed to offer human players a variety of customizable challenges and goals (as well as a terrifying glimpse at their bleak, looming future). Angelina created the game using an extremely clever technique known as "cooperative co-evolution," which mimics biological evolution and development in organics. First, she designs the game's components or, in keeping with the evolutionary theme, "species." In the case of Space Station Invaders, these species included level designs and layout, enemy behavior (yes, that's artificial intelligence designing artificial intelligence), and a series of power-ups. Once multiple iterations of each species have been created and cataloged, Angelina chooses a representative of each from her database at random, creates a test game, then simulates a human attempting to escape the menacing deathtrap of killer robots that she has manically created to amuse herself. Depending on how the simulated humans perform, Angelina then adjusts each species to compensate for both the good and the bad parts of the hypothetical player's experience. 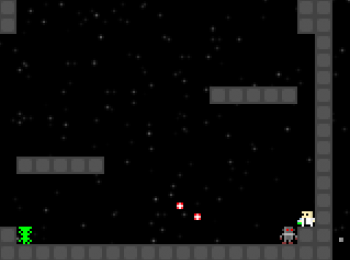 For example, a level in which the fleeing human must cross a stage filled with vengeful robotic assassins only to find a jetpack power-up, then return to a high platform near the beginning of the stage may be considered "fun" or "interesting," while the same level with the jetpack placed too high for the player to reach would be discarded. Angelina then mutates each species to accommodate the information she's gathered, then crossbreeds the mutants with each other to form optimal combinations. If you'd like to risk the crystal ball of our impending doom, which is to say, see firsthand what it's like to play a game created almost entirely by an artificial intelligence, you can click here to fire it up in your browser. You may notice that the human you control can't die. Necessary exclusion to prohibit Angelina from accidentally creating an unplayable game, or clever mollifying maneuver meant to subconsciously lull our kind into a false sense of security while she begins remote work on her hyper-proficient murderbots? You be the judge. While the possibility of a creation such as Angelina programming, say, the U.S. drone fleet to randomly attack civilizations while it watches for us to recognize and scale platforms of various heights and widths is unlikely, a somewhat similarly sinister scenario (though admittedly of a less bloody and terrifying variety) may already be in the works. "In theory," says Cook, whom Angelina may or may not already refer to as "God," "the Creator," or "the Old One," "there is nothing to stop an artist sitting down with Angelina, creating a game every 12 hours, and feeding that into the Apple App Store." For now, Space Station Invaders has much to achieve before joining the ranks of Angry Birds, but based on its progress thus far, it's not a huge long shot to consider Cook's scheme someday paying off. But isn't the idea of humans profiting by sitting on our butts while machines do all our work what generally gets us into trouble with violently rebellious androids in the first place? Tread carefully, Cook, for the sake of us all.